Children are invited to bring their favorite stuffed animal or doll for a sleepover at the Museum. After snack and story time together, the stuffed friends are tucked in, kissed goodnight and left in the good hands of the METC staff. But like all good sleepovers, after dark at the Museum is when the fun begins. When children return anytime between 10 am and 4 pm on Sat. March 24, they will receive a framed picture of their favorite friend showing the “trouble” they got into at the Museum. Madison's annual Easter Fun Fest event is on its way! 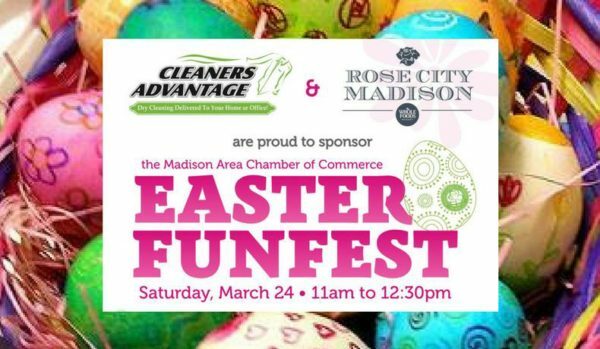 The Madison Area Chamber of Commerce is preparing for the Easter Bunny to bring plenty of candy and toy-filled Easter eggs to the downtown businesses during its annual Easter Fun Fest event on Saturday, March 24 from 11:00am to 12:30pm. Children and their parents are invited to bring their Easter baskets and visit Chamber-member merchants in Madison in order to collect candy and toy-filled eggs. The event is free of charge and is sponsored by Cleaners Advantage, 888-471-7676 and Whole Foods Market, 222 Main St.
Children can visit with the roaming Easter Bunny and enter to win a new bicycle donated by Peter Daniele, the proprietor of Rose City Collision, 291 Main St. There will also be a "Count the Jelly Beans" contest with additional prizes to be won. The Chamber of Commerce will raffle off special gifts provided by Madison businesses. The gifts will be displayed under the black Chamber tent on the corner of Waverly Pl. and Main St.
Chamber-member businesses will feature festive balloons on their doors to indicate their participation and hospitality. For more information, please contact Madison Area Chamber of Commerce Executive Director Karen Giambra at MadisonChamber@gmail.com or at 973-377-7830. Also visit the Chamber website at MadisonNJChamber.org. The popular Easter Bunny Express returns to the Whippany Railway Museum for its 26th year. The Easter Bunny and train crew will greet guests and hand out holiday treats to kids on this 10 mile, round trip journey along the Morristown & Erie Railway's historic Whippanong Trail. Departures for this 45-minute ride departs are scheduled for 1pm, 2pm, 3pm and 4pm. These rides usually sell out, so advance internet ticket reservations are strongly recommended. Goodnight Moon is a celebration of familiar nighttime rituals. Before his bedtime, the rabbit goes around the room and notices items within eye sight and says goodnight to all of them. As the story continues, the rabbit gets more and more tired before finally saying “Goodnight noises everywhere,” just as he falls asleep. The Runaway Bunny is the tale of a little bunny who tells his mother that he is going to run away, becoming variously a fish, a rock on the mountain, a crocus in a hidden garden, a bird, a sailboat, a circus acrobat, and finally a little boy, until he resigns himself to stay where he is and remain her little bunny. Whimsical puppetry and evocative original music will bring a new sense of appreciation to stories that have delighted several generations. This two-act ballet is a lively re-telling of the well-known fairytale about a brother and sister who wander into a forest where they are captured by a witch in a fantastic gingerbread house. In a classic good-triumphs-over-evil plot, the spunky youngsters defeat the witch, free other children she had baked into gingerbread, and are reunited with their loving parents in the happily-ever-after finale. The ballet incorporates the beautiful Engelbert Humperdinck “Fourteen Angels” bedtime prayer and features New Jersey Ballet’s original “storyteller” narration so even the littlest theatergoer can keep up with ease. Now, if I could just convince everyone to stop wearing clothes. . . .